Fan pleats and fan tucks are such an elegant method for releasing fabric softly, I'm surprised they aren't used more often. It's a treat when I find them in vintage patterns, typically for blouses and dresses, and most often at the neckline or shoulders. This sketch provides true inspiration! Labels: 1940s, Blouse, Designer, dress, fan pleats, fan tucks, Originator, Originator Publishing Co. I love it, but it IS difficult to get the pleats even. 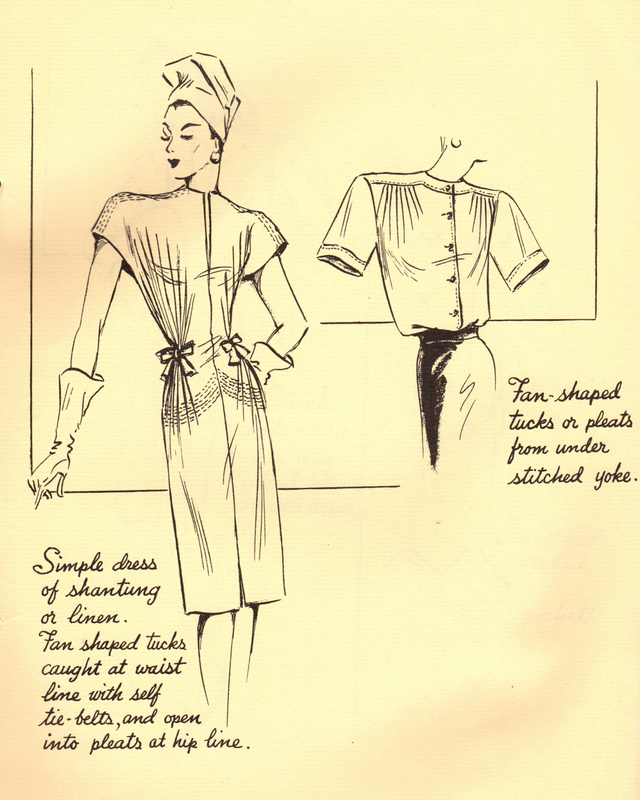 One Pattern, Many Blouses - Inspired 1940s Style! Accessorize Your '60s Cocktail Dress! Mid-1950s Evening Tunic and Slim Skirt - Exotic! What Was Miss Lillian Wearing?